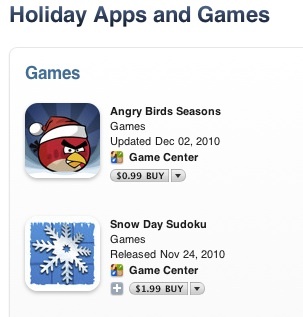 Bad Weasel Game’s newest game has just been featured in the Holiday Games section right next to Angry Bird’s Seasons. Snow Day Sudoku is part of the Sudoku Book family of products and is a deep winter / Christmas themed version of our popular game with calming falling snow effects and much holiday cheer. This year Bad Weasel Games is sponsoring The Water Project, which is a US-based non-profit committed to providing clean, safe drinking water to those who suffer needlessly without it. Bad Weasel hopes to finance several clean water solutions this season and has decided to donate $1 for each copy of Snow Day Sudoku sold between now and December 31, 2010. We will post updates here as to our progress, and show photos of our completed water projects later in 2011. The great thing is that Snow Day Sudoku is staying the same low price of $1.99 – so it’s a win-win. Get a great game at a great price and feel good about it at the same time.